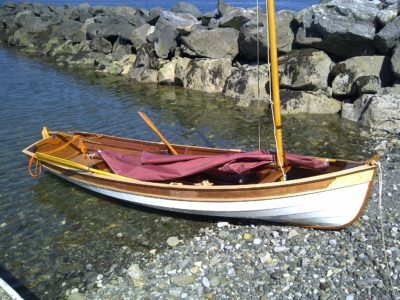 I’ve been rowing my Whitehall a lot, leaving the sailing rig and the rudder at home, but I decided that I could put the rudder to good use by making it possible to steer with my feet. Now I can devote my stroke to power instead of holding a course. The Phoenix III is Ross Lillistone’s most popular design, but its glued-lapstrake construction, with its bevels and gains, was not the easiest method for novices to take on. His First Mate is a stitch-and-glue equivalent of the Phoenix III with the same hull, rigs, and cockpit layout. 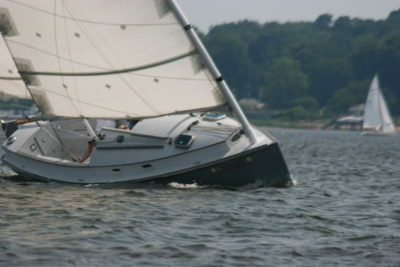 It provides an easier path to the launching and the same performance afloat. If the Runabout 14 looks like a classic, its designer, Jacques Mertens-Goossens, the founder of Bateau.com, has hit his mark. The boat’s appearance was inspired by a 1950s design, but its structure is a contemporary blend of plywood, fiberglass and epoxy. A 1950s newsreel offered a glimpse of English craftsmen making racing shells and oars in the Eton Boathouse on the River Thames. 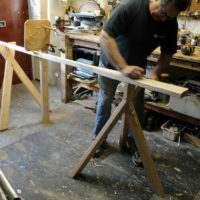 The system they used to hold the oars while working on them did away with clamps and was fast and efficient. 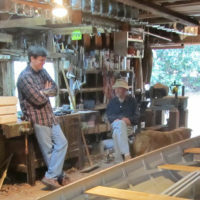 Nick Blake is a boatbuilder living on a plot of Mississippi land that has been in the family since the 1830s. Nick built a modified version of a Chapelle Whitehall with the help of his father, tools passed down from his grandfather, traditions established by his great-grandfather, and lumber milled from trees grown on his great-great-grandfather’s land. Barb Geiger’s father had dreamed of building a stitch-and-glue kayak but when a stroke restricted him to a wheelchair, he thought his dream was out of reach. Barb didn’t agree. They ordered a kit and got started on the project. Sadly, he didn’t live long enough to see the boat finished and launched. 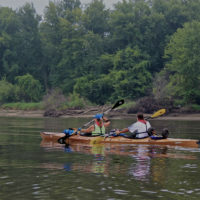 He would have had good reason to be proud of the kayak—it carried Barb and her husband safely on a 2,000-mile journey across America. Most sliding-seat rigs come with outriggers that require long, racing-style sculls. The Poseidon sliding seat provides power without changing the nature of the boat. It’s meant to be used with gunwale-mounted oarlocks and the same kind of oars used for fixed-seat rowing. Camp-cruising requires lighting, and these three solar-charged, waterproof, and inflatable lanterns illuminate tents, boat canopies, and camp kitchens with a bright diffuse light at night, can charge your phone, and recharge themselves during the day.